co-organized by Judith Beyer (Konstanz) and Madeleine Reeves (Manchester). The last three years have seen a flourishing of anthropological and historical monographs on Central Asia. 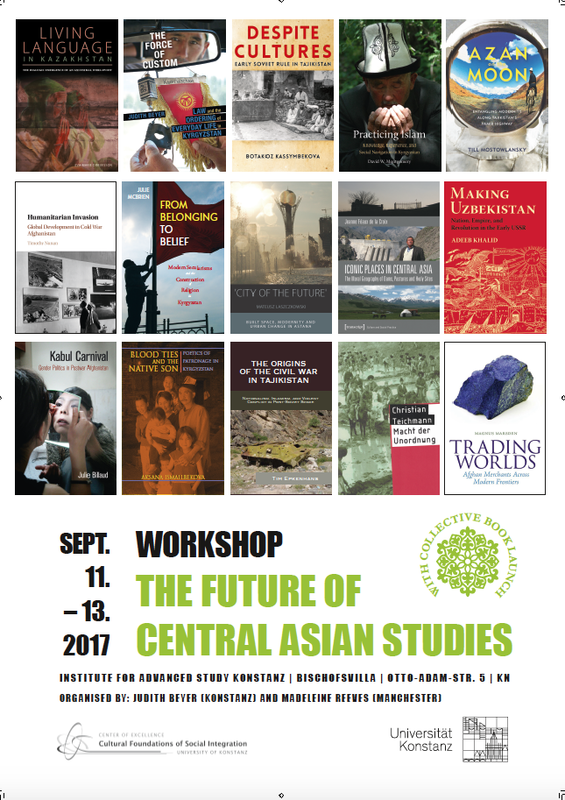 We propose an innovative workshop format that seeks to launch several of these recent monographs and to use a discussion of their findings as a basis for reflection on the future of Central Asian studies. The workshop will facilitate a series of focused discussions that emerge from bringing the texts into conversation with one another. How can material from Central Asia inform conceptual debates about order, knowledge, modernity, empire, religion and resources in the widest sense? What can be gained from drawing together anthropological and historical scholarship on law and empire, or dynamics of peace and conflict? How can we better integrate the history and anthropology of Afghanistan to allow comparison with the rest of Central Asia? The book panel discussions will be videotaped and edited versions of these discussions will be made available to an international audience. For a full programme see here. This entry was posted in Allgemein, anthropology, Central Asia, conferences, field research, Kyrgyzstan, outreach on 20. August 2017 by Judith Beyer. Scottish kilts, Japanese ninjas, African body painting and Halloween in America: are these traditions genuine? This question seems to be relevant at first sight, but from an anthropological point of view, it is not the most pressing. When dealing with such ‘traditions’, we should rather seek to understand which actors, in which context, when and for what purpose present a certain practice, a discourse, or an object as ‘traditional’. ‘Tradition’ has been regarded as a counterpart to ‘modernity’ especially from the 19th century onwards. The term was coined negatively, as an obstacle that had to be overcome. Soon, though, ‘tradition’ also came to be romanticized. Within the framework of colonialism in the 19th and 20th centuries, the concept gained new relevance worldwide. By its application, selected practices could be classified as intrinsic parts of people’s ethnic or local identities. Commonly, even practices that only emerged as part of (and in response to) colonization became classified as ‘traditions’. The famous criticism of these processes speaks of the ‘invention of tradition’ (Hobsbawm and Ranger 1983). The subsequent scientific debates were largely concerned with the concept of authenticity, and with it the assumption that traditions had a pure origin and were always at risk of being falsified, mixed, or forgotten. This point of view has also been critically reflected in anthropological debates. In recent decades, the importance of ‘tradition’ has been examined especially in the context of nation-building processes, as many of the newly emerged post-colonial states are strongly recruiting the idea of ‘traditions’ to promote a stable cultural collective identity. Currently, ‘tradition’ is also being actively promoted in the context of recognition claims by representatives of indigenous groups – but this has at times also been to their disadvantage. In this seminar, under the rubric of ‘neotraditionalisation’, we will focus on the critical reception of the concept of the ‘invention of tradition’, especially the problem of authenticity, on the role of ‘tradition’ in nation-building processes, as well as on current debates on indigenous movements as well as the negotiation of ‘tradition’ at an international level (e.g., non-governmental organizations) and its adjudication by state courts. This entry was posted in anthropology, teaching, theory on 1. August 2017 by Judith Beyer.